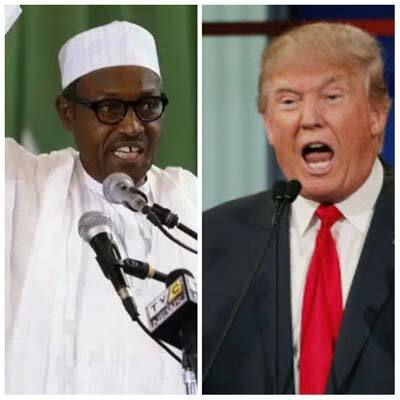 BUHARI SPEAKS TO TRUMP, GETS INVITED TO THE U.S.
President Muhammadu Buhari this afternoon from London spoke to President Donald Trump on telephone at the request of the American President. The conversation was cordial and President Buhari congratulated Trump on his election as President of the United States, and on his cabinet. President Trump encouraged President Buhari to keep up the good work he is doing, and also commended him for the efforts made in rescuing 24 of the Chibok Girls and the strides being taken by the Nigerian military. President Trump assured the Nigerian President of US’ readiness to cut a new deal in helping Nigeria in terms of military weapons to combat terrorism. President Trump also invited President Buhari to Washington at a mutually convenient date.